UNITED NATIONS, August 29 -- This month after France ousted its Ambassador to the UN Jean Maurice Ripert, he was quickly named to a UN Under Secretary General post, as a humanitarian envoy to Pakistan. The UN's fast accommodation of Ripert led Inner City Press to ask, on August 24 and August 26, how many French USGs the UN system has, and to write twice on the answers. Four days later, French Foreign Ministry spokesman Romain Nadal was quoted in ISRIA.com that "we perceive no bad intentions towards our country through the questions that were asked. These questions fall within the free exercise by journalists of their profession." Paris-based ISRA went on to chide Inner City Press for describing "French diplomat Jean-Marie Guehenno... as a 'do-nothing USG' despite Mr. Guehenno's major achievements in peacekeeping operations from 2000 to 2008." Yes, Inner City Press used the phrase "do-nothing USG" for Guehenno, quite literally. After heading DPKO, Guehenno was quietly named USG for Regional Cooperation, a new post, like Ripert's. The UN never announced it, but confirmed it when Inner City Press discovered it. 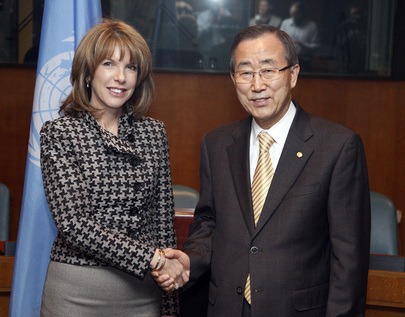 Later, in the Spring of 2009, Inner City Press interviewed Mr. Guehenno across the street from the UN, and asked what tasks he had done for the UN since his appointment. None, he answered candidly. The UN had not assigned him a single job. That is why we called him literally a do-nothing USG, and mused, as we had in print back in the spring, if such no show jobs might not constitute immigration fraud. 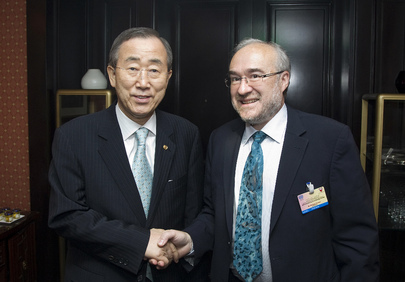 Since the publication of Inner City Press' August 24 and August 26 articles, the Spokesperson for Ban Ki-moon Michele Montas has written Inner City Press that "One update on yesterday’s question : Mr. Guehenno's appointment had expired effective close of business 31 July 2009. He is no longer a staff member." 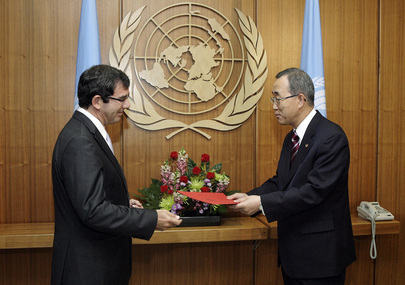 So sometimes the UN does the right thing, even if only belatedly. For the record, during Guehenno's time at DPKO, Inner City Press often cover him favorably, and respected his requests, as in the case of Congolese warlord Peter Karim. But afterwards, still unexplained is the UN's rationale for giving Guehenno a USG post, with attendant immigration, tax and travel privileges, without expecting him to do any work? Similarly, why was the French chief the the World Meteorological Organization for example not included in the UN's presentation of French USG's in the UN system? The list that Ms. Montas read from on August 26 from the briefing room podium, apparently intended to downplay the number of posts given to France in the UN -- who prepared it, and why? Watch this site. Footnote: the ouster of Ripert is viewed by insiders as a long expected move by Sarkozy adviser Jean David Levitte against his rival Bernard Kouchner, of whom Ripert is a follower. So in essence, due to French infighting, the losing flotsam washed up on the UN's shores and a USG post was created. This happened, though less embarrassingly, with Guehenno as well. Is this done for other countries? Do other countries even ask for it? UNITED NATIONS, August 26, updated -- France has four Under Secretary Generals in the UN Secretariat, while China has only one. Inner City Press asked about and reported this on August 24, after UN Spokesperson Michele Montas announced the hiring of outgoing French ambassador Jean-Maurice Ripert as a USG special envoy to Pakistan. On August 26, Ms. Montas unilaterally updated her response, emphasizing that the United States has ten USGs and France has only four. Spokesperson: Montas:I was asked on Monday about the number of French Under-Secretaries-General (USGs). 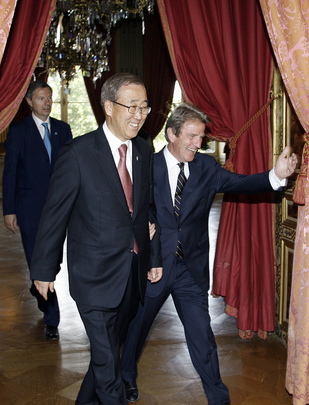 The United Nations system presently has four French Under-Secretaries-General. Two of them are $1-a-year appointees. Question: How many American USGs (Under-Secretaries-General)? Spokesperson: Yes, I have the number for that also: we presently have in the system 10 American USGs, and 4 of them are $1-a-year appointments. And this number includes the heads of WFP [World Food Program], of UNICEF and of UNRWA [UN Relief and Works Agency for Palestine Refugees in the Near East]. Spokesperson: Guehenno is one-dollar-a-year contract. Now, you have the recent appointment that we had of the Ambassador (Jean-Maurice Ripert of France as Special Envoy for Assistance to Pakistan). And, let me see whether I have more, a larger list on that. There are four French Under-Secretaries-General. Philippe Douste-Blazy, who is a dollar-a-year man, Special Adviser on Innovative Financing for Development; Jean-Marie Guéhenno, who is a dollar-a-year man, as a Special Adviser of the Secretary-General on Regional Cooperation; and we have Alain Le Roy, who has a fixed term as Under-Secretary-General for Peacekeeping Operations. Inner City Press: How about Dominique Strauss-Kahn of IMF [International Monetary Fund], Michele Jarraud of the WMO, if you’re counting…. Inner City Press: How about the Global Fund to Fight AIDS; is that a UN Agency? Spokesperson: The Global Fund to Fight AIDS, yes. Inner City Press: And, Michel Kazatchkine? Spokesperson: Do we have to go through all this, Matthew? I told you who the people are who have French nationality, and that’s all I have. Afterwards, Ms. Montas argued that WMO is not included because it has its own governing board. But so do UNICEF and WFP. To some it appeared that the list prepared for Ms. Montas, which she later provided as background, not to be put online, was skewed to understate French USGs. The list also does not mention Jan Egeland as a Norwegian USG,* but shows that the UK's Ian Martin has a USG post with the Department of Political Affairs. Inner City Press asked if Joaquim Chissano, who has suspended his mandate to the Lord's Resistance Army impacted areas, is still a USG -- among other things, does he still have a UN laissez passer passport? That are more questions to be analyzed from the list -- watch this site. * - shortly after publication of the above, Norwegian sources contacted Inner City Press to say that it's known there, where Ban Ki-moon is now slated to visit, that Egeland quietly ended his post-OCHA mediating USG post. But that was never announced by the UN, just as the doling out of a no-work USG post to Jean-Marie Guehenno was never announced, only quietly confirmed when Inner City Press by chance discovered it. What's wrong with the UN?